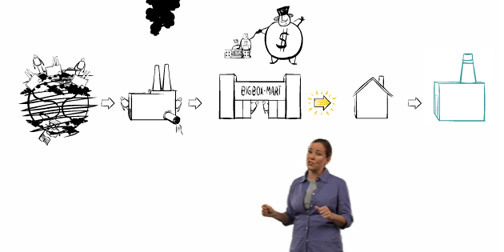 The Story of Stuff is a great 20 min animated speech by Annie Leonard examining a product's life cycle and the environmental and social side effects of each part of the process. It focuses on production and consumption trends that we have fallen into like bad habits and can't get away from. Whether you are involved in a product's development or you are just a consumer, this movie and website will definitely make you stop and think. (Found through Kaleidoscope's inspiring Greener Grass project).